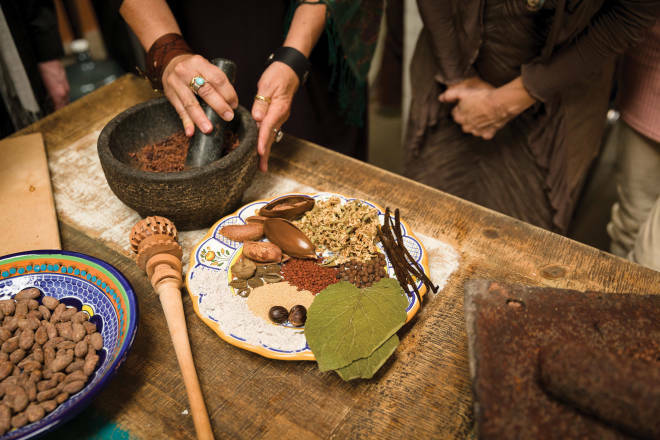 A bean-to-bar chocolatier in Santa Fe revels in the deepest flavors of our favorite indulgence—and lets you feel the cacao. Above: Cacao students utilize ancient technique. MELANIE BOUDAR will change the way you think of chocolate. At Art of Chocolate: Cacao Santa Fe, she takes taste buds on an unforgettable journey. Go to a class and you will, for the first time, taste things (good things) that you cannot un-taste. Warning: This life-changing experience is not without its drawbacks. For one thing, you’ll be ruined for checkout-aisle chocolate. It will suddenly seem like bland, overly sweet, cocoa-buttery junk. Who needs to trade in their childhood cocoa-nuttiness for craft chocolate expertise? I say that you do. First, because during the introductory, two-hour Food of the Gods workshop, you get to both work with and eat a whole bunch of chocolate. More urgently, getting your doctorate in chocolate is just plain cool. Between the craft microbreweries and the artisanal coffee shops, foodies have succeeded in training many of us to notice and appreciate subtleties of flavor in things we used to not think too hard about. We used to like “coffee.” Now we ransack baskets of K-Cups, searching for that one special variety, because nothing matches the bright, tangerine notes of a single-origin Ethiopian Yirgacheffe. Am I right? Also, it’s February and you know what that means. Are you going to be the oaf who still buys heart-shaped boxes of cremes at the drugstore? It’s time to up your game. BOUDAR&apos;S SHOP OPENED about a year and a half ago in a small warehouse space tucked into the increasingly artsy Siler Road area, about three blocks from Meow Wolf. In the front is a glittering jewel box of a shop, with a glass case full of gorgeous truffles and a tempting selection of chocolate bars. The ingredients of the shop’s Rise and Shine bar include coffee, Chimayó chile, piñon nuts, and 60 percent dark milk chocolate from the Dominican Republic. Why do you care what country your chocolate comes from? Follow Boudar and let the master show you. Those who sign up for one of the workshops or hands-on classes here (five are offered regularly) first gather around the coffee bar for a pour-over of house-roasted Sumatra Mandheling. Boudar’s friend and co-owner, Derek Lanter, is a coffee expert, and at the shop, coffee and chocolate enjoy a symbiotic relationship. On the morning I show up, we gear up with coffees, then dive deeper into the warehouse, where a crenellated wall of burlap sacks forms a small fortress around a gleaming treasure: a hammered-copper small-batch roaster, modified to handle coffee and the more delicate cacao beans. We huddle around as Lanter fires up the roaster and dumps a sack of Dominican cacao beans into the hopper. Three distinct varieties of cacao—Criollo, Forastero, and Trinitario—are often blended in commercial chocolate. Even the untrained sniffer can discern the fruitiness of one variety from the earthiness of another. Lanter scoops a sample from the roaster and pours it out for us to examine. The freshly roasted beans look a little like cocoa-dusted almonds. You have to rub off the papery husks to reveal the dense, brittle nibs inside. Dark, shiny, and aromatic, they taste bitter; but also like the essence of chocolate. This is where the whole bean-to-bar thing starts to make sense: If you can taste the difference between varieties and understand how where they’re grown affects flavor, why not capture that and emphasize it? Plus, part of the popularity of bean-to-bar chocolate is supporting fair trade and ethical growing practices. We sit at rustic wooden tables to learn more. All chocolate comes from a small evergreen tree, Theobroma cacao, Boudar says, flipping through photos on poster boards. She explains how the trees are planted, how the flowers are pollinated, how the fruits are harvested and fermented. Deciding when to stop the fermentation is apparently as tricky a task as a winemaker’s when it comes to flavor. But enough talk. It’s time to get our hands chocolaty. Boudar grabs a bowl of cacao beans and leads us to a steel prep table. “This is Crankenstein,” she jokes, gesturing at a hand-cranked machine about the size of a food processor. As she pours beans into the hopper on top, she invites one of my classmates to turn the crank. It’s a bean cracker, Boudar says, that removes the husks from the beans, freeing the nibs inside. Aside from her Hawaiian plantation, Boudar owns a stake in a 50-acre cacao farm in Belize. She wants to support the small farmers who continue to grow heirloom varieties, and some of these devices helped their businesses survive and expand. To demonstrate winnowing, she plugs in a hair dryer. It’s incongruous, it’s cheap, and it works. She tosses the beans in a basket while another volunteer simply blows the husks away. Next we pour nibs into an electric meat grinder. Seconds later, out come dark brown spaghetti strands of what is starting to look like chocolate. With all the heating and grinding, the place starts to smell like cupcakes. I might be drooling a little. We take the mash to one of the wooden tables, where there’s a molcajete and mano, the kind of basalt mortar and pestle I use to make guacamole. Boudar puts some of the paste into the molcajete and starts grinding. It’s too gritty for our finished product, a traditional hot chocolate drink. So we grind. I take my turn, pressing the mash into the sides, turning and turning the mano around in the bowl. I start to imagine how much labor it must have taken ancient Mesoamericans to make one cup of their revered ceremonial drink. More than 5,000 years ago, pre-Colum-bians began cultivating and preparing chocolate, a precious substance traded among cultures as far north as Chaco Canyon. Boudar shows us replicas of the tall black-and-white cylinders the Chacoans used for their ceremonies. Found decades ago, the vessels were only recently tested to reveal traces of chocolate. What did the Chacoans’ drink taste like? How did they make it? It probably wasn’t so different from this, I’m thinking as I grind and grind. Boudar adds allspice, cinnamon, and coconut sugar, acknowledging that early chocolate drinks were rarely sweetened. She heats water and sets out tiny ceramic mugs. Adding some of the mash to a pitcher, she pours hot water over it, froths it with a wooden molinillo, and adds a few drops of vanilla. Taking our seats at the table, we slurp our first tentative sips … and … it’s amazing! It’s unlike anything I’ve ever tasted. Forget mini marshmallows in a packet of powder. This is intensely chocolaty, and the other ingredients highlight what I now know are the cacao beans’ intrinsic flavors. I draw hearts and stars in my notebook. Now that our palates are trained, we’re ready for the single-origin tasting. Boudar has given each of us seven small pieces of chocolate, wrapped in different colors of foil, and a flavor-wheel diagram, like those at a wine tasting but filled in with words for tasting chocolate. We will experience three waves with each sample, Boudar says—a burst, then flavor, then a finish. I nibble off a corner of the first one. All my years of wine tasting fail me as I struggle to come up with words for what I’m tasting. I stare at the wheel. Is it woody? It’s 60 percent chocolate, Boudar reveals, 40 percent sugar. Ah! That’s how well sugar masks the true flavor of cacao. There’s a Tanzanian bar I find too acidic; a Hawaiian sample that’s pleasantly citrusy; and, finally, one that suits me perfectly. The 72 percent bar from Belize is fruity but slightly burnt. I love it. “Welcome to the world of craft chocolate,” Boudar says. I feel like a Muggle at Hogwarts, finally learning the secrets of the chocolate wizards. As we stumble back into the store, I feel a little cocoa-drunk and go on a bit of a shopping binge, picking up a handful of 72 percent bars from Belize and the Dominican Republic. Some truffles seduce me, too. I can’t wait to go home and share what I’ve learned. But can I bring myself to share my special chocolate bars? I pick up a few more. Chocolate historian and pastry chef Mark Sciscenti, who bakes and teaches classes at Cacao, shared these three recipes that showcase the unique flavors of craft chocolate. Get experiential with chocolate, starting with the state’s Chocolate Trail. nmmag.us/ChocTrail.